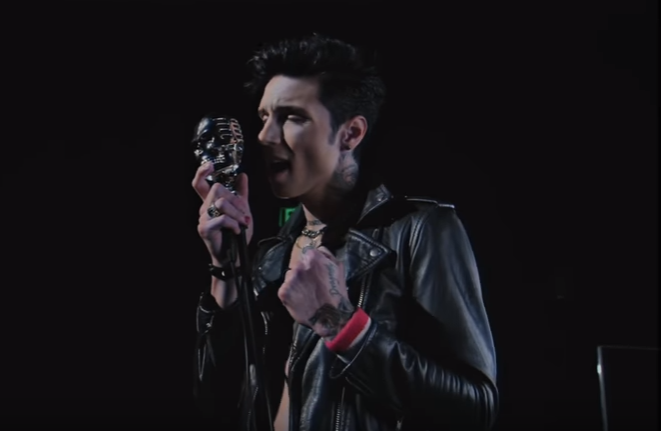 Black Veil Brides frontman Andy Black‘s version of Frank Sinatra’s undying ‘My Way’ is not just a cover, hidden at the end of the CD. It now has a solid music video, combining the singer’s signature visuals with a classy Sinatra hue. Watch the stylish video below! While creating this punk rock cover, Biersack got inspired by Sid Vicious but did it his own way. You might be a little confused by the intro and outro of the video where you see some kid. Well, “some kid” is in fact Biersack himself. The musician added some childhood footage to add a retro touch to the video. And it’s absolutely adorable! “I have always loved this song and the idea of doing my own take on it as an homage to my influences was initially inspired by the [AltPress] cover shoot and story,” Biersack explained his choice of ‘My Way’ on Instagram. If you haven’t seen our 20 fun facts about Andy Black, be sure to do so and you’ll find out why Biersack’s childhood was way different from his classmates. Did you know that at school Andy was bullied because of his style of clothing? Could you imagine that as a teenager Andy was overweight? Read more fun facts here. Be the first to leave your comments and stay tuned with AlteRock Facebook and Twitter to never miss on the news about your favorite alternative music!